Francisco “Pancho” Varallo is the only survivor of the 1930 World Cup. Today his footprints will be immortalized alongside those of Maradona, Platini and Di Stefano, among others. Knows everything in one more chapter of the legend. Golden Foot selected him to be part of a gallery more than special. This gallery gives an account of the most important players in history. 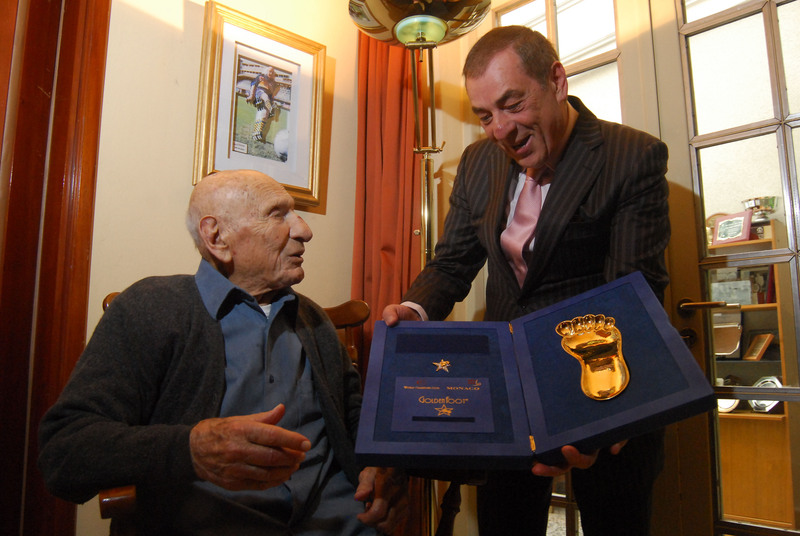 Antonio Caliendo, Chairman of the institution, came to Argentina and was well received by the family of “Pancho.” Caliendo took the footprint of “Pancho” to be displayed on the Principality of Monaco. Varallo recently turned 100 years. The Official Website accompanied him on that unforgettable day, and now I could not be the exception. Varallo was visibly moved by reviewing other glories that share the privilege as Maradona, Santos, Eusebio, Di Stefano and Rumenigge, among others. Questa voce è stata pubblicata in Golden Foot e contrassegnata con boca juniors, champions promenade, francisco varallo. Contrassegna il permalink.